They were a bit mean laughing at Fluttershy but I don't think think they meant it. Cloudchaser! I really want to see more of these two. 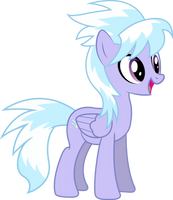 Especially such that we can see Flitter's Cutie Mark unblured and unobscured so we can actually see what it looks like. I had to make a guess based on what I could find out from the wiki "three dragonflies". 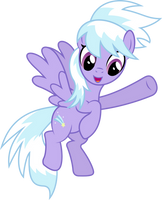 I vectored my own Cutie Mark for flitter. Mind If I make A Base? I have no problem with that. Just credit me when you do. Thanks. These two are my favorite OCs, besides Derpy. Very nice! looks like you like Cloudchaser?